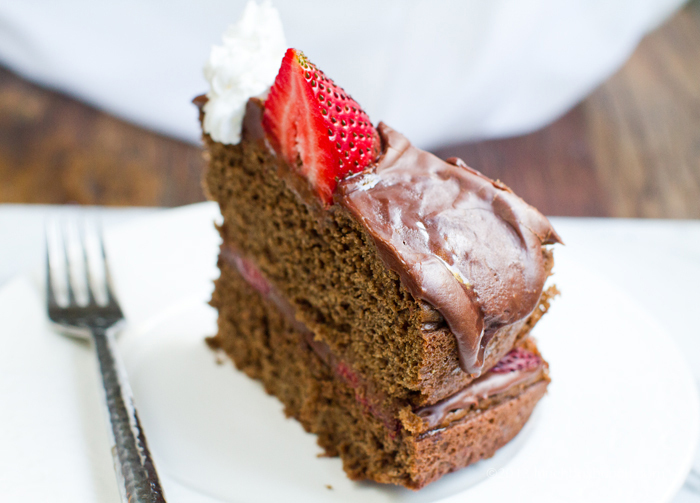 Double Chocolate Ganache Strawberry Layer Cake. Vegan! 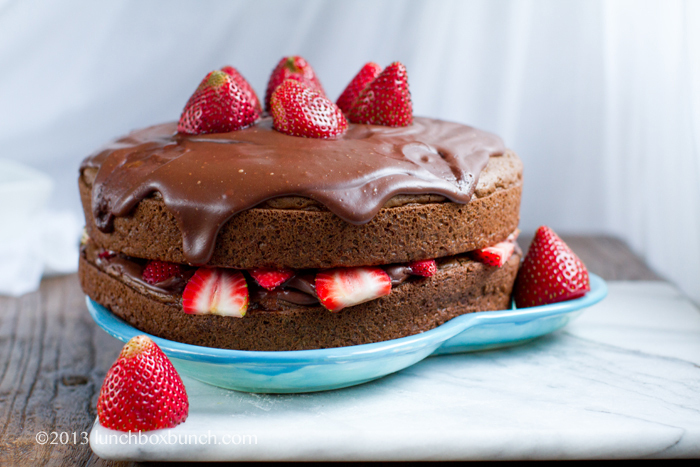 This Double Chocolate Ganache Strawberry Cake is perfect for some well-deserved Valentine's Day decadence. 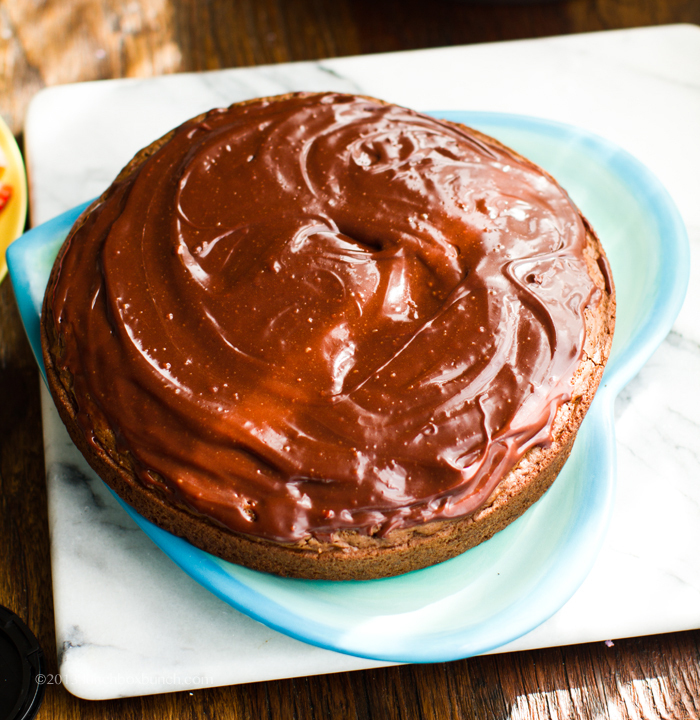 After the cake cools a bit, the ganache turns its melty satin layers into firmed up ripples of chocolate art.. The cake is not too sweet, which I really love. 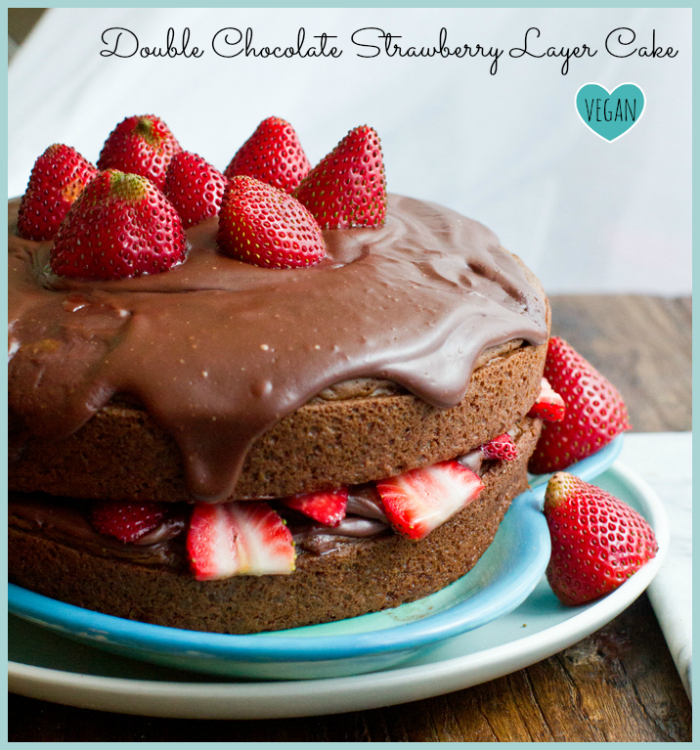 The fresh berries and chocolate richness really takes the flavor lead here. 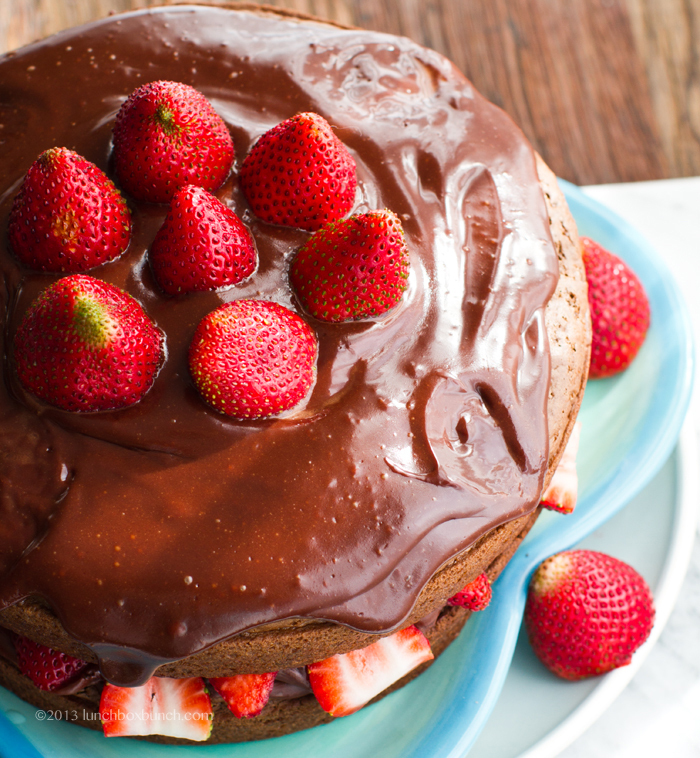 The creamy chocolate ganache frosting compliments the sweet, juicy strawberries perfectly! 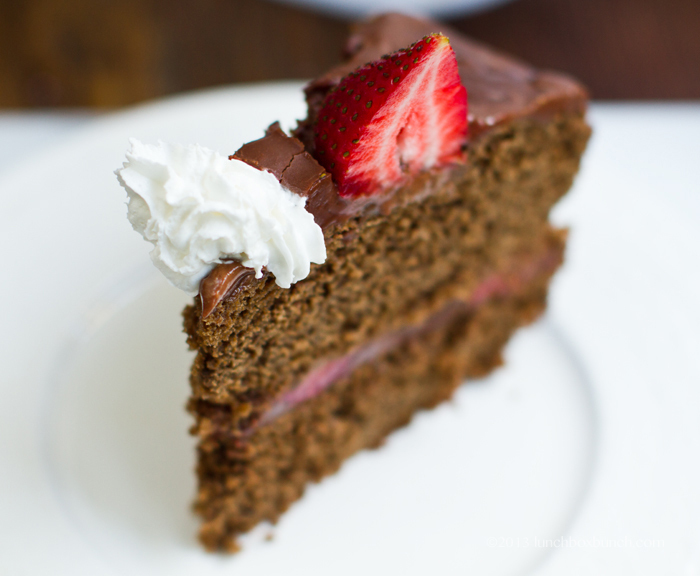 Slices of leftovers are super delicious too..
A few videos of me making this cake, be sure to follow me on Vine App! 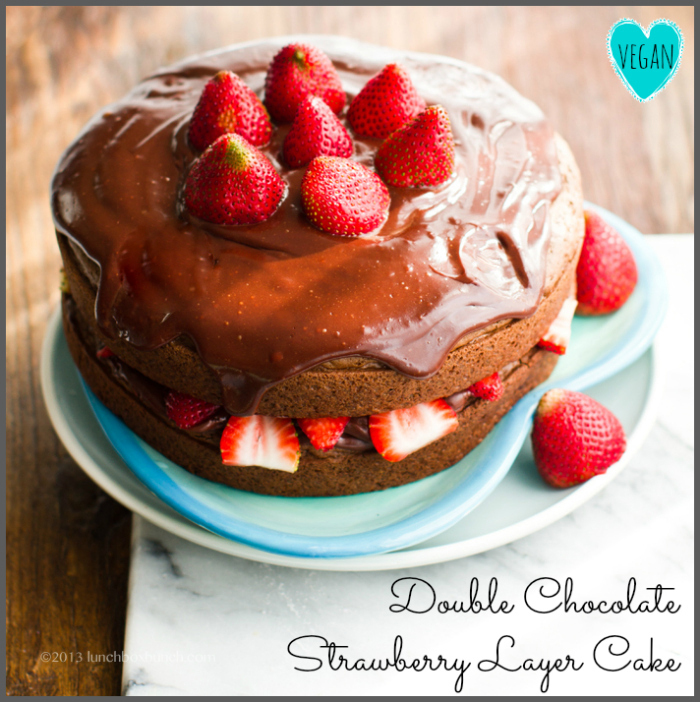 Rich and fluffy layer cake mingles with chocolate ganache frosting and freshly sliced, sweet strawberries. Tools: 2 9" cake rounds. 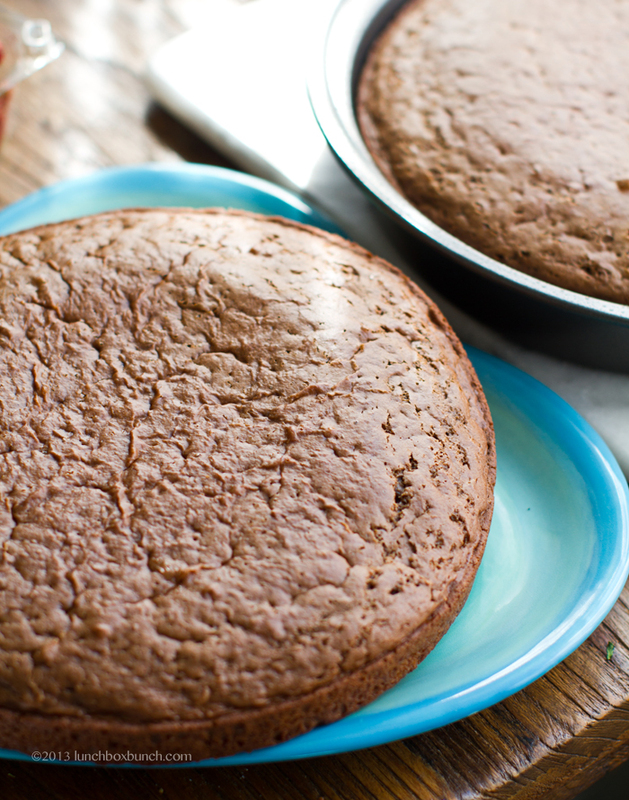 Grease your two round cake pans with coconut oil and set aside. cCombine dry ingredients in a large mixing bowl, mix well. Combine the flax (or chia) egg ingredients and stir briskly. Set aside to thicken for 2-3 minutes. After 2-3 minutes, add all the liquid ingredients to the dry bowl and fold in the flax egg. Using a hand beater, whip the batter until smooth and silky, about 1-2 minutes on medium speed. Bake cakes at 375 degrees for 25-30 minutes, or until they appear to bake through. Do the toothpick test if needed. 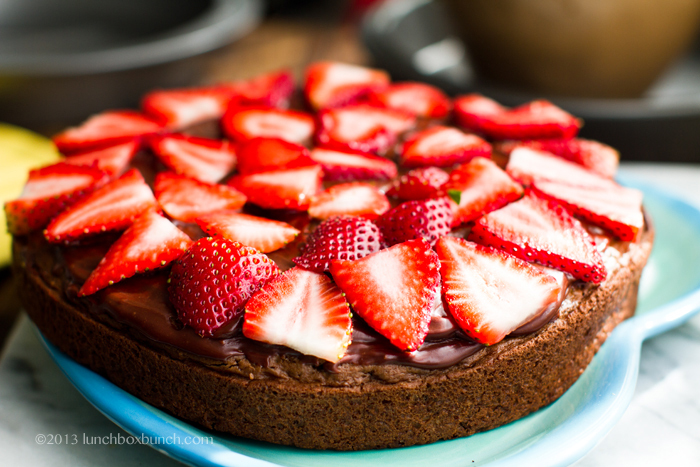 Remove baked cakes from oven and allow them to fully cool before assembling cakes. 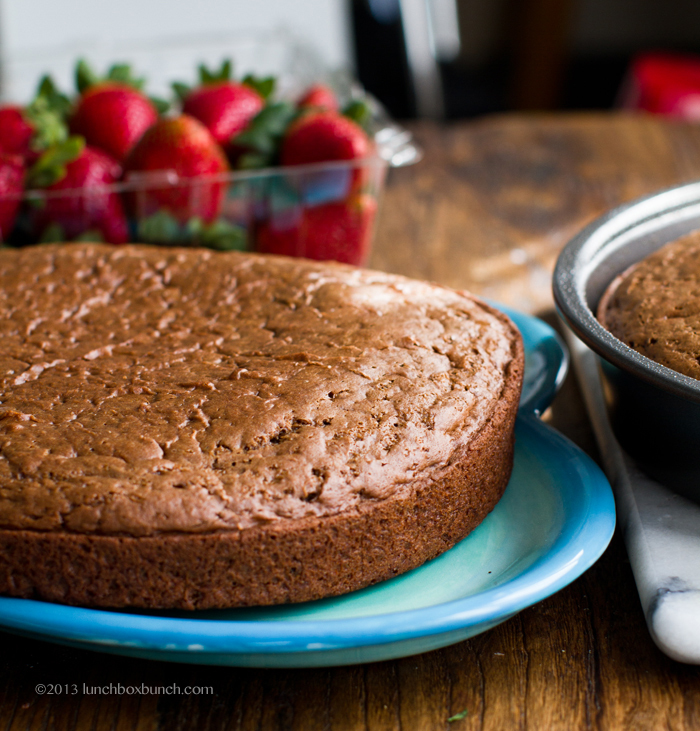 Cakes should be ready to be removed from the pan after about 15 minutes of cooling off. Use a cooling rack if available. 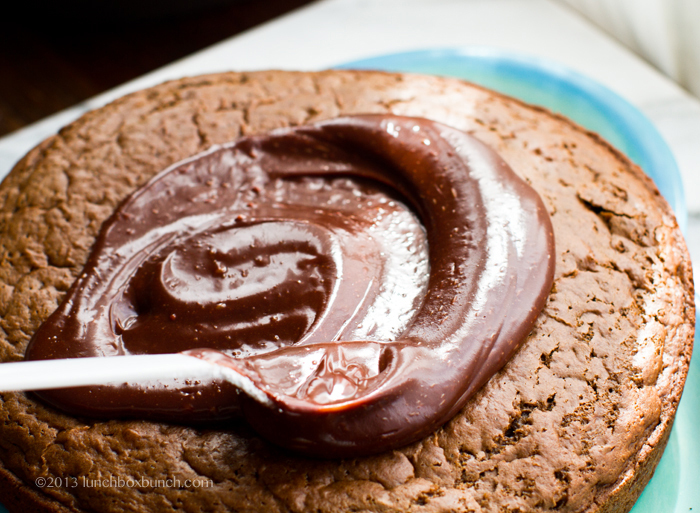 Make your chocolate ganache. Add the chips and coconut oil to a medium bowl. Place in microwave for 30 seconds on high. Remove. Stir, stir, stir as the chips melt with the heated oil. If still lumpy, place back in microwave 10 seconds at a time and stir until creamy. Next, add the powdered sugar to the melted chips. Using a hand or stand mixer, blend until very thick and combined. This will get really thick like a fudge. Now the best part. Heat your vegan sour cream in the microwave for a good 30-60 seconds or until steamy and hot - melted. Add the hot sour cream to the chocolate and blend on low. The mixture will smooth out to a silky consistency within seconds. Blend until smooth. 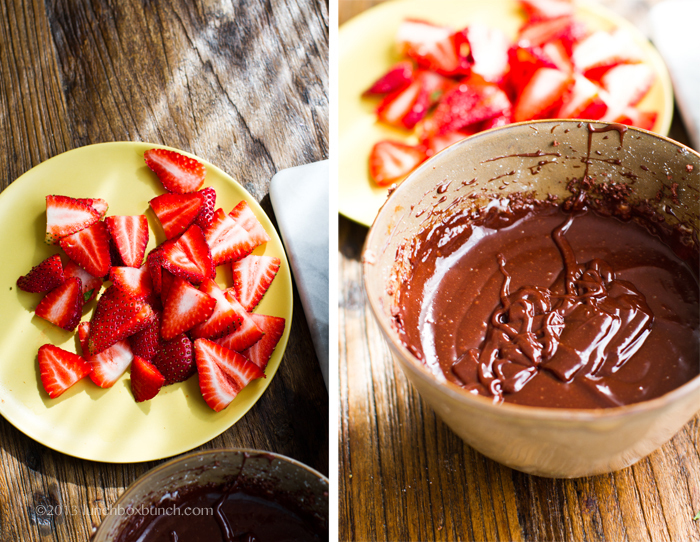 Fold in optional salt and flavorings to ganache. Set aside. Note: you may use a small sauce pan and a stovetop in place of microwave if desired. Pour the slightly warm ganache over top the chilled from the freezer bottom cake layer. 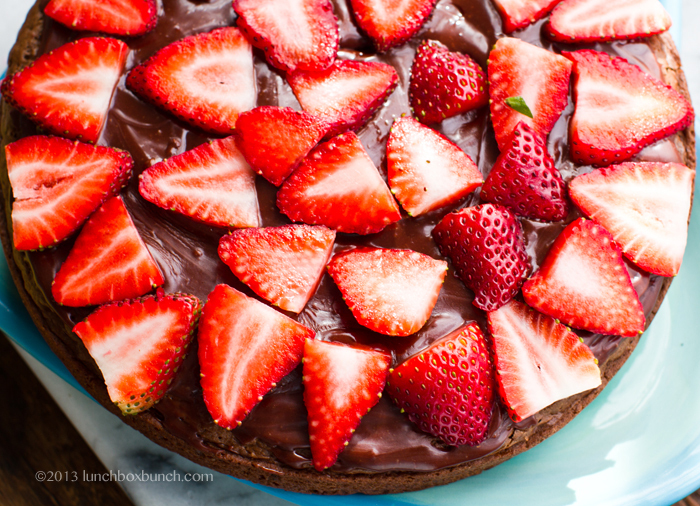 Then add a layer of sliced strawberries over top. 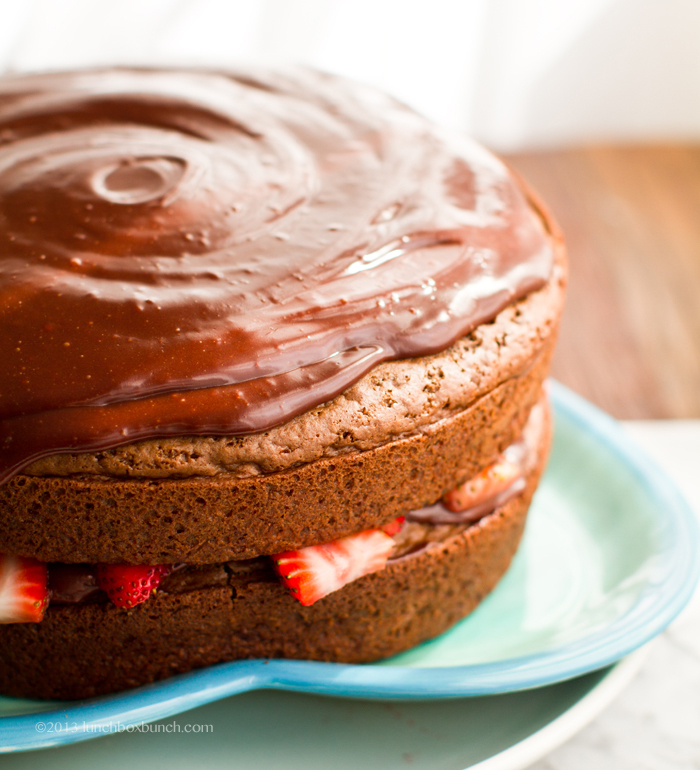 Then add the other layer of cake and drizzle more ganache over top. And add more berries on top. 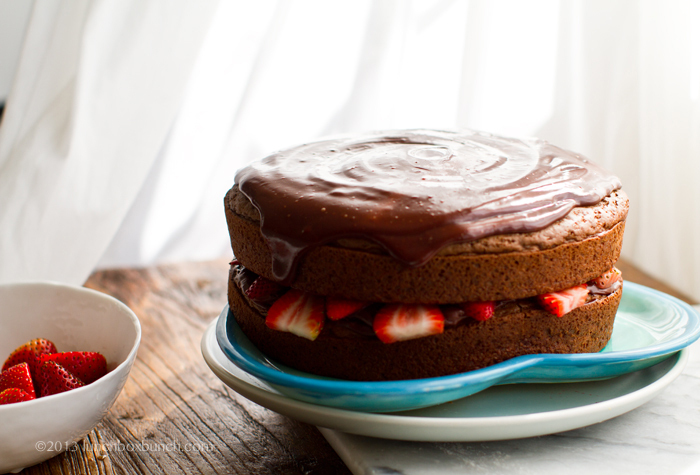 If you want the ganache fully chilled for serving, place cake in the fridge to chill. Otherwise, serve warm for rich and melty ganache. Store on your counter (covered if you have a cake display cover) for up to 24 hours. After that time, store in the fridge for up to a few days or freeze for longer storage.